Whether you are planning for your first baby or your third, decorating the nursery is a task that all parents-to-be enjoy in anticipation of the birth. Many parents want to have a custom look that does not resemble what you can typically pick up at the store. Instead, parents want to be in control of the design from the crib and bedding down to the color of the walls. With a custom made crib bedding set, you can easily get the look you want for your baby’s room without having to create all the covers and blankets yourself. When you are creating a custom look for the nursery. the best place to start is with the crib. Cribs generally come in a dark wood stain, a light wood stain or painted white. Any of these colors are neutral enough to go with wild patterns and bright colors or a more subtle color scheme. Aside from wood choices, you can also choose to have cribs painted in any color you want, as long as the paint is safe for children. Next, you can choose the bedding that will go with the crib and the color of the walls in the nursery. When you choose to go with a company that can provide a custom look, the possibilities of patterns and colors are endless. You can choose from subtle, sweet patterns for a little girl or sports themed patterns for a little boy. There are also plenty of gender neutral options for bedding in case you are waiting to be surprised as to what your baby will be. 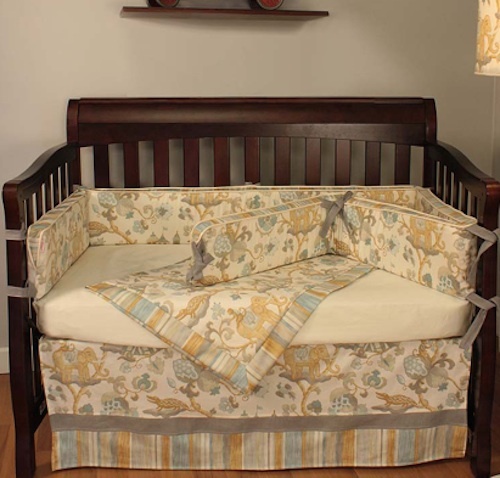 Custom crib and bedding designers will also offer a number of accessories that can be matched or coordinated with the bedding that you choose. These accessories can include diaper stackers, lighting, pads for the changing table and diaper bags. You may also find that some custom companies also offer artwork that can be put on the walls of the nursery to bring the whole look together. Choosing what your baby’s nursery will look like is a fun and exciting adventure. You want it to be beautiful and calming for your new little one so they can sleep in a great room for years to come. My sister is actually expecting now!!! I will share this post with her! These are great tips. I definitely was not prepared when my boys came. Beautiful crib and bedding set in the photo! We aren’t planning on anymore children and only had a nursery with our first, but my sister just had a baby in November.